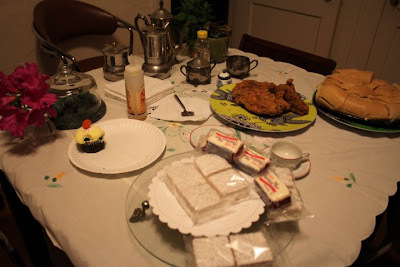 I decided my first party at my new home would have to be a "Mad Tea Party", a "costumes required" housewarming get-together with copious amounts of tea. This weekend the party was launched. 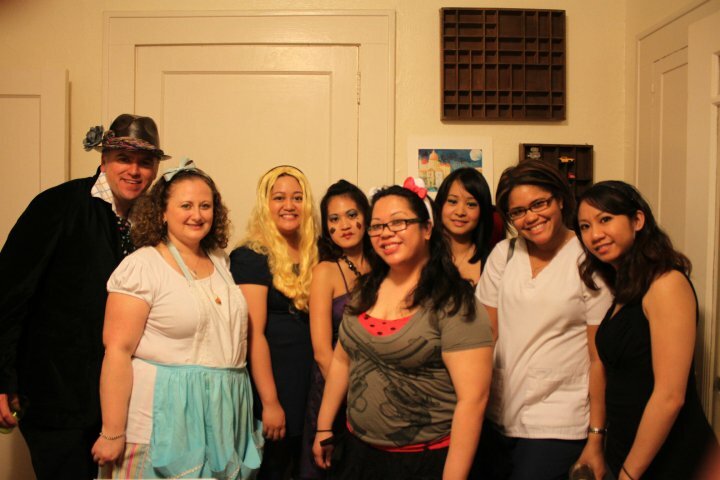 Tea was served and costumes included a Mad Hatter, Two Alices, a Harjuku girl and a Red Queen. I wore my Hugh Hefner smoking robe and played host. The ultra-sweet Thai Tea with cream was a favorite! Bernadyn is an amazing Baker/Artist! 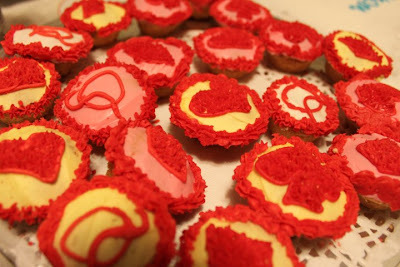 Thank you for the tasty tarts! My friend Bernadyn surprised me with strawberry tarts made from scratch. 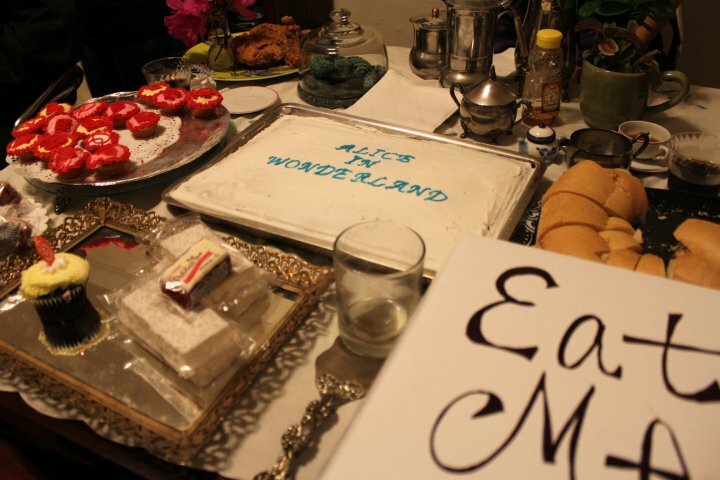 Look at the amazing Alice in Wonderland details! 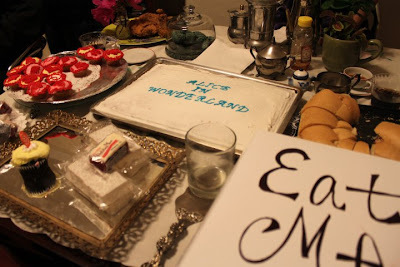 She also made the fun Alice in Wonderland cake and an "Eat Me" box full of mini coconut cakes. My fridge is full of sugary treats and I'm a little scared to go home with a fridge filled with sweet temptations. 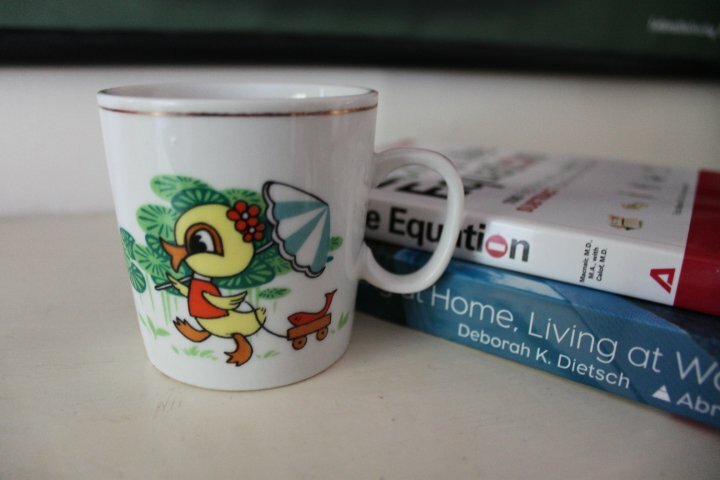 A new favorite Tea Cup, Thank you Chris, April & Joy! I received an adorable vintage cup from my "Dr. Sketchy's" friends, I can't stop staring at it, it's the exact kind of Asian graphic design I'm powerless to resist. 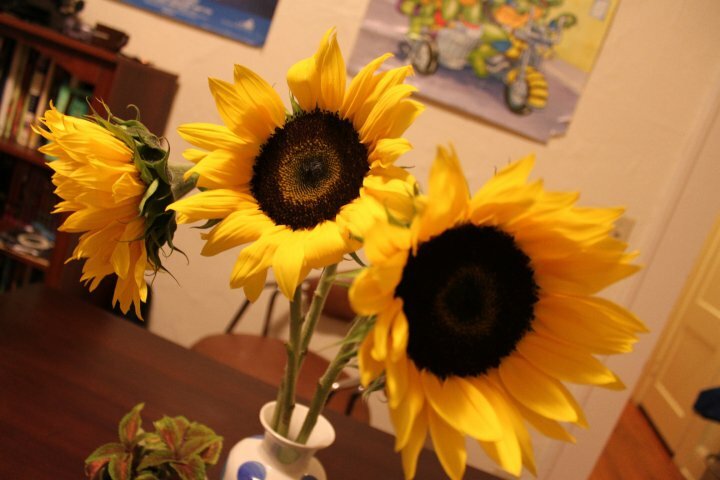 My friend Mike helped me brighten up my new home with a bouquet of Sunflowers, they are gorgeous amid my colorful posters and toys. 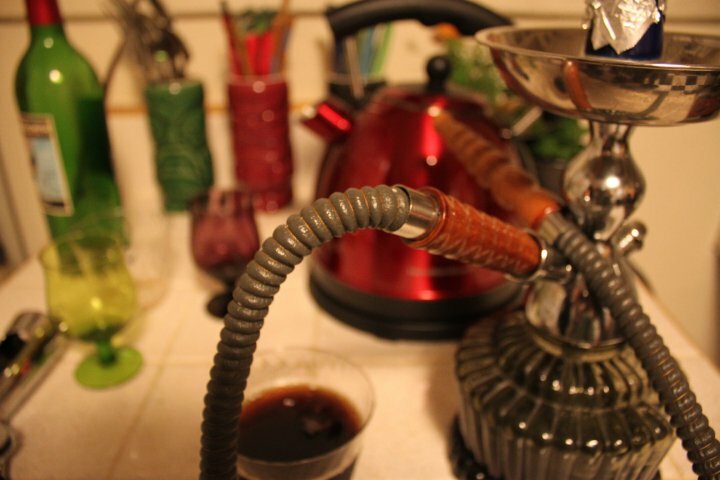 Someone bought Hookah! I don't smoke- but it smelled nice! I was incredibly grateful to fill my little apartment to maximum capacity with friends, watch my friends share a hookah (had to disable the smoke alarm soon after! ), and gather with them in the living room to watch my favorite nerdy movies. I can't wait to host Craft Nights and more even more silly tea parties in the future. I'll dream up funner set-ups and themes in the future! Fun group shot, though some of the guests hid from the camera! I wished that I could have come. I nearly threw a similar party for the movie release but I just couldn't get my act together. 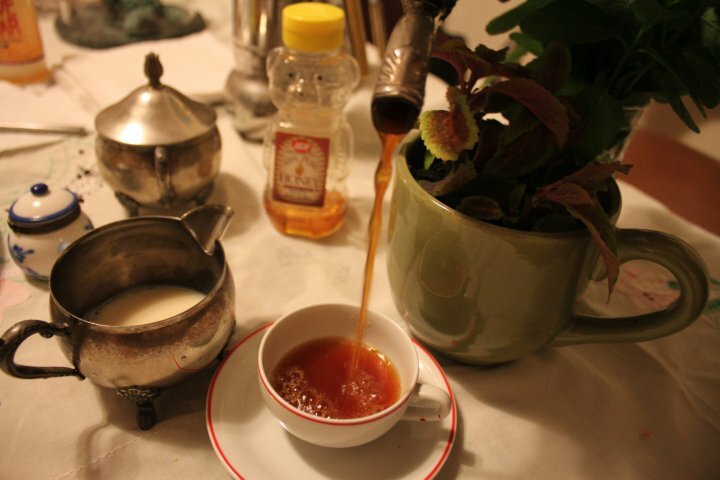 The food in these photos look beyond delicious. I wish you could have come, too! 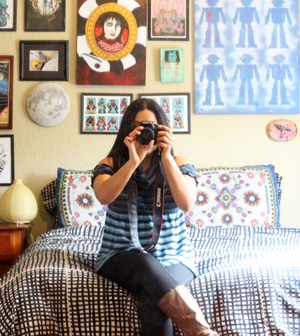 I hosted the party one week after as a way to force myself to unpack quickly. It worked! If summer traffic, them can evoke a person significant family vacation. Home buying last longer pretty much, your children will be outside education, as well as demand from customers to get the summer months go tries for a takedown right up by way of diverse close family. The summer months family vacation is definitely coming, it is the time frame to contemplate the project in this the summer months holiday getaway. omega replica Around Asia you will have a massive different vacation spots out there for it to cost a person's very difficult won holiday getaway. Not surprisingly the top pops is a heart warming Indian relic with huge batch routes which will us dot all of our Himalayan and various mountain / hill degrees. Just simply just remember to pay for reputable plus excellent essentials, move about a wheat with the chaff so to express. replica prada handbags You will see ample essentials companies sold in the market, a number high-quality as well as some with seriously terrible information. fake rolex Don’t autumn for any bait of your reasonably priced essentials that is certainly remaining bandied pertaining to over the internet by way of quite a few few efficient web pages plus websites. rolex replica Have got a figuring out observation and you will then look for the great baggage that they are a person's travel companions to the the summer months trips that you've ended up longing for to get many months on end. fake gucci handbgas All these couple of train's wheels includes separated travellers for instance next to nothing in advance of. For your personal older folk kinfolk heading out for the summer months family vacations so that you can pilgrim web pages just like Kedarnath and also Shirdi Claime Baba, strolleys absolutely are a significant fortunate thing.